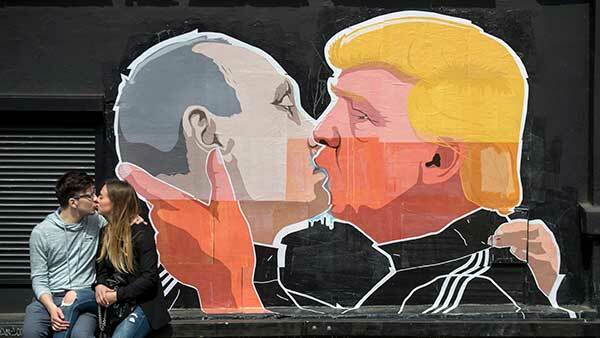 COPENHAGEN, Denmark -- A street artist in Lithuania has adorned a barbecue restaurant with a poster showing Donald Trump locking lips with Vladimir Putin. Restaurant owner Dominykas Ceckauskas said Saturday the presumptive U.S. Republican presidential nominee and the Russian president both have huge egos "and they seem to get along pretty well." He said the image is "an ironic view of what can be expected." Local artist Mindaugas Bonanu created the wheat paste poster for the eatery in the capital Vilnius on Friday. It's on the outside of the Keule Ruke restaurant- Lithuanian for "Smoking Pig" - along with the text "Make Everything Great Again" - a play on Trump's slogan "Make America Great Again." Ceckauskas said the poster was a nod to a 1979 photograph of Soviet leader Leonid Brezhnev kissing East German ally Erich Honecker on the mouth - once a customary greeting between Socialist leaders. The iconic shot was later painted on the Berlin Wall. There have been no calls to remove the more than 2-meter (6 -foot) poster. Berlin once was the symbol of the Cold War, Ceckauskas noted. "We think that the border now is not in Berlin, but somewhere here in the Baltic states, between (the) East and the West," he told The Associated Press. Lithuania - and its Baltic neighbors Estonia and Latvia - regained its independence in the early 1990's after nearly five decades under Soviet occupation and the 1991 Soviet collapse. More than a dozen people were killed and scores were injured in a Soviet crackdown on Lithuania's independence drive in January 1991. All three Baltic nations have since joined NATO.